The bright, bold colours help to stimulate visual perception and hold your babys interest. A variety of smooth, soft and hard textures are used to create interest and encourage tactile development for baby. Gross motor skills can be practisedby shaking and grasping the ball, whilst silky ribbons and moveable plastic beads help practise your babys fine motor skills. 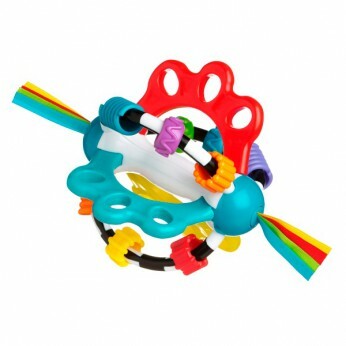 This toy costs approximately £4.99 (for the latest and best prices make sure you check our retailer list for the Playgro Explora Ball above). In our review of Playgro Explora Ball we classed it as being suitable for ages 0 to 11 months but recommend you check the manufacturer specific advice before purchasing.